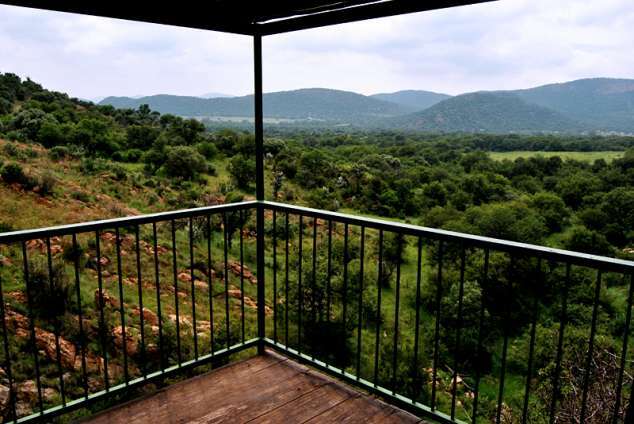 Thabela Thabeng Mountain Retreat - Parys Accommodation. 2023 million years ago a meteorite struck planet earth formed the Vredefort Dome. This impact has left a beauty out of destruction that is utterly breathtaking, historically fascinating and rich in a unique and diverse micro-ecosystem of fauna and flora. In the midst of this World heritage Site, lies Thabela Thabeng, nestled in and between the mountains and Vaal River, 100km from Johannesburg. Thabela Thabeng means: "Be Happy in the Mountains". Advice that is not hard to follow at this beautiful resort. The luxury chalets nestle deep and secluded in the heart of the Mountains. Chalets have balconies with breathtaking views, fire places and cozy lapas. They are fully equipped for self catering. Country and Nature lovers, street-stressed visitors, tourists and geologists from around the world come here to stay. Dassie: Romantic bay window with corner bath overlooking the valley. Fire place. Lapa. Plumbago: On edge of cliff above waterfall. Private bathroom-with-view. Fire place. Lapa. Rockhaven: Absolutely exclusive and private bush chalet with corner bath in bay window. Magnificent rock forms wall. Fire place. Eagle's Nest: 2x 2 bedrooms, one with double bed. Bathroom-with view. Fireplace. Lapa. Chacma: (Tjacma) 2x 2 Bedrooms + 2 beds in lounge area. Log cabin. On hill top near Chacma Baboon's rock. Fire place. Bathroom + luxury open air shower on balcony. Amanzi: 3x 2 en-suite bedrooms. Next to streamlet deep in mountain. Own splash pool on patio. Fireplace. Excellent birding. Thabela House: No fuss farm house, 5x 2 bedrooms and 4 bathrooms. Huge lounge/dining area. Fireplace. Lapa. Duiker: 1x 2 en-suite room and 2 single beds in loft (open plan). At the foot of the mountain, near reception and swimming pool. Lapa. Acacia: 1x 2 Bedroom, 2 extra beds in lounge/kitchen area. Patio with braai. Near swimming pool. GPS coordinates: S 26° 51' 38" E 27° 17' 14"
Detail description : We offer a variety of rustic, individually designed chalets secluded in the mountain with unique features like wooding decks, rock walls, corner baths, outside shower with view and much more. 173349 page views since 19 May, 2005.